This dining set finished in rustic russet brings a warm natural feel to your home with its live edge table top. The slight beveling details on the legs soften the strong wood lines of the trestle. 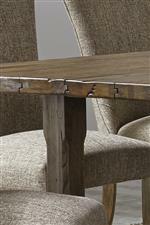 Exposed joinery on the tables edge is a very unique touch that continues the farmhouse feel of this table. Its medium finish also means this table works with darker or lighter decor giving you plenty of styling options for your home. Perhaps the best thing about this dining set is the generous size which makes it perfect for gathering the entire family together. The Havenbrook 5 Piece Trestle Dining Set by Liberty Furniture at Furniture Discount Warehouse TM in the Crystal Lake, Cary, Algonquin area. Product availability may vary. Contact us for the most current availability on this product. Given a medium rustic russet finish this collection is very versatile as it would be at home in any color scheme. The live edges and reclaimed wood create an authentic rustic style. These details help bring the farmhouse feel to the trestle table, but its generous size makes it the perfect spot to gather the entire family around for fun holiday dinners. In the midst of all the rustic details the chairs help to make this collection more modern and casual. The ample storage and built in wine rack allow the sideboard to bring style and storage to your dining area. When brought all together this collection brings a slice of casual rustic style to your home. The Havenbrook collection is a great option if you are looking for Casual furniture in the Crystal Lake, Cary, Algonquin area. Exposed joinery adds unique rustic style. Browse other items in the Havenbrook collection from Furniture Discount Warehouse TM in the Crystal Lake, Cary, Algonquin area.